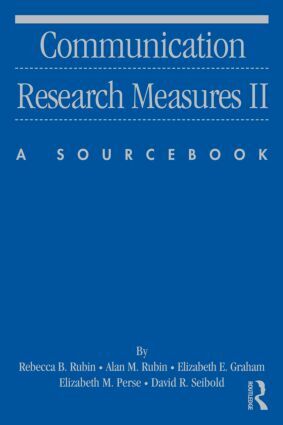 Expanding and building on the measures included in the original 1994 volume, Communication Research Measures II: A Sourcebook provides new measures in mass, interpersonal, instructional, and group/organizational communication areas, and highlights work in newer subdisciplines in communication, including intercultural, family, and health. It also includes measures from outside the communication discipline that have been employed in communication research. The measures profiled here are "the best of the best" from the early 1990s through today. They are models for future scale development as well as tools for the trade, and they constitute the main tools that researchers can use for self-administered measurement of people's attitudes, conceptions of themselves, and perceptions of others. The focus is on up-to-date measures and the most recent scales and indexes used to assess communication variables. Providing suggestions for measurement of concepts of interest to researchers; inspiring students to consider research directions not considered previously; and supplying models for scale developers to follow in terms of the work necessary to produce a valid and reliable measurement instrument in the discipline, the authors of this key resource have developed a significant contribution toward improving measurement and providing measures for better science.